2015 BMW F 800 GS. 2015 BMW F 800 GS Adventure. 2015 BMW F 800 GT. As of model year 2015, the R 1200 GS will not just be available with new paint finishes. With a view to enhanced running smoothness, it will also be fitted with a crankshaft with increased gyrating masses as in the R 1200 GS Adventure and R 1200 RT. In addition, the R 1200 GS can also be fitted with the BMW Motorrad Keyless Ride System as an ex-works option. This enables both the steering lock and the fuel filler flap to be locked and unlocked. The motorcycle is started using the starter button as before. With Keyless Ride, the key can always remain in the rider’s clothing. The Shift Assistant Pro available as an option ex works allows the rider to shift up without clutch, enabling acceleration virtually without torque interrupt. It also allows downshifting without using the clutch. 2015 BMW R 1200 GS Adventure. R 1200 GS Adventure can now also be fitted with a lowered suspension. In conjunction with a reduction in seat height by 50 millimetres to 860/840 millimetres, the R 1200 GS Adventure is now also within reach of customers for whom the previous seat height posed an insurmountable obstacle. If a further reduction in seat height is required, the R 1200 GS Adventure can also be fitted with the seats of the R 1200 GS. This reduces seat height by an additional 20 millimetres. As of model year 2015, the R 1200 RT will be supplied in a new two-colour paint finish and can also be fitted with the BMW Motorrad Keyless Ride System as an ex-works option. This enables the steering lock, fuel tank can and storage compartments to be locked and unlocked without using a key. The motorcycle is started using the starter button as before. With Keyless Ride, the key can always remain in the rider’s clothing. 2015 BMW K 1600 GT and GTL. The BMW luxury touring bikes K 1600 GT and GTL will be supplied in new paint finishes as of model year 2015. What is more, the two model variants now benefit from Dynamic Traction Control (DTC) as standard for increased safety when accelerating. In addition, the K 1600 GT/ GTL can also be fitted with the BMW Motorrad Keyless Ride System as an ex-works option (already included in the fittings of the K 1600 GTL Exclusive). This enables the steering lock, fuel tank can and storage compartments to be locked and unlocked without using a key. The motorcycle is started using the starter button as before. With Keyless Ride, the key can always remain in the rider’s clothing. K 1600 GTL Exclusive featuring new scales and particularly high-end chrome surfaces. 2015 Special model BMW K 1300 S Motorsport. K 1300 S Motorsport, BMW Motorrad now deliberately emphasises the dynamic character of this popular sports touring bike. Fitted as standard with ABS like all BMW motorcycles, the BMW K 1300 S Motorsport highlights its athletic flair with a new colour concept in the BMW Motorsport colours Black storm metallic, Light white and Lupine blue metallic, combined with red decorative stripes. The black engine spoiler and the tinted windshield provide a fascinating contrast. Reflecting its sporting aspirations, the K 1300 S is also fitted with HP wheels for optimised handling, an Akrapovic rear silencer and HP footrests for rider and passenger. 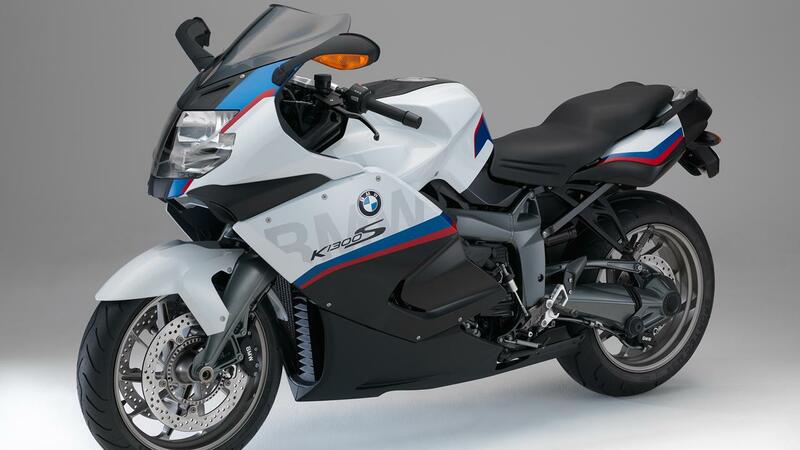 The market launch of the BMW K 1300 S Motorsport will be on August 1st 2014 at a price of â‚¬ 19,950 incl. 19% VAT. 2015 BMW K 1300 R.
K 1600 GT / GTL for maximum user-friendliness.